Get the new 735 that comes with the infeed/outfeed tables and if you find a good deal you should be able to get the cart free or reduced cost. Sometimes it also comes with a free set of extra blades. IMO – you won’t need the shelix cutter unless you do lots of planing (1000’s of BF). Check Amazon, Rockler, and any other big internet woodworking sites. Generally, you can find free shipping and no tax as well. The 735 is the best planer in it’s class. Look around you could save some $$. The Dewalt cart is really slick. Good maneuverability and no rattles. 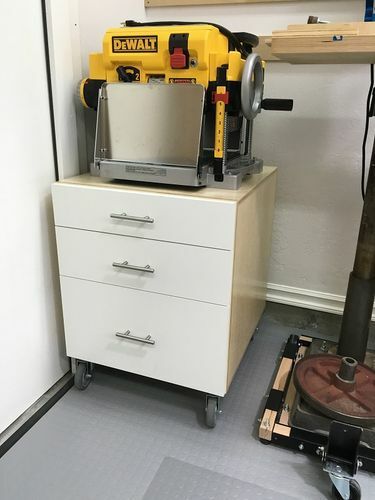 Lets you tuck that planer against a wall without wasting any shop space. You can’t build a cart for that price. The Shelix is great on the 735 as well. One way or another, I recommend that upgrade. Took me about 6 months but I finally got one for $300 used off of CL. No cart, no indeed/outfeed tables. There were actually 2 up at the same time, one was $350 and came with the indeed/outfeed. I tried to bargain that to $300 and the guy ghosted me. 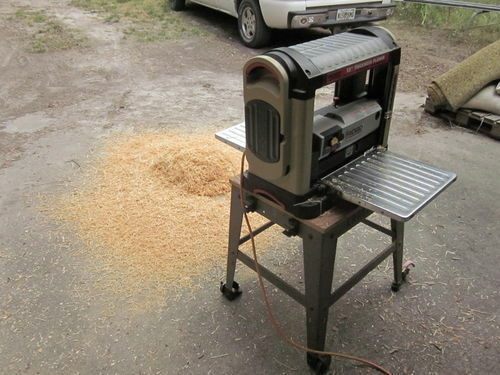 Ended up with just the planer for $300, and I’ll probably pick up the tables which run $50. The only reason I got the $300 is the guy was selling stuff off an estate and needed to get rid of it quickly. So if you’re willing to wait, there is hope. I have plans to potentially get the Shelix head, but I’m just going to see how things go. 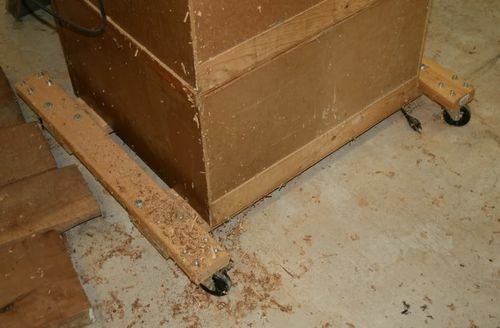 I don’t use a lot of highly figured wood, and by the time I’d break even on the cost of replacement knives vs. the Shelix, I suspect I’ll have already moved into a bigger planer. I put mine on a toolbox I had, and now use the drawers to hold lots of stuff. Pick one for whatever height you need, they come with wheels. track of them. Personally I would buy new. You do not know how abused a used one is. I built my own crappy stand, so I am no help on your second question. Good luck. Hey Andrew, I didn’t check the other replies, but Grizzly is doing a 735x deal for 649$. That’ll include the indeed/outfeed tables, an extra set of blades, and also the mobile cart. If you sign up for their email adverts, you’ll be immediately send a 10% no limit discount code. Obviously there’s shipping to consider, but a $65 discount might help take the sting off a bit. Hope this helps! I mounted my 735 on top of a 3-drawer cabinet I built and put locking casters on it. This made for a nice shop project, gives me extra storage space, and very easy to tuck it away when not in use. Thanks everyone for the responses. It gave me more to think about. Very impressed with this website on the amount of response and promptness of responses. I have been to other forum sites (for boats and fishing) and was lucky to get a response a week later. It is very stable and the time to switch devices is minimal, and the cost is low as well. Go with the Shelix head, you won’t regret it! I built a cabinet/cart with casters for my 735. I’m always short on storage space, so the Dewalt stand was wasted space to me. As for the stand I think you guys sold me on building my own. Not due to the cost, but do to the extra storage and customization of it. I tend to like thinks put away so Im not constantly wiping dust off of stuff. Otherwise you just get the one shelf (not dust free) under the dewalt stand. I have owned maybe 8 735’s over the years. People keep buying them off of me. Anyhow I’m 6’2” and I felt the cheesy table DeWally sold with their very nice lunchbox was way to short for me. I made a quicky cabinet, has a ton of interior space, for storage. 2 doors with 2 shelves, and a few drawers. I mostly keep other tools in it, because all the accessories for the planer are on it. It’s 46” tall x 30” across, and 28 1/2” deep. I mounted it on the Ho Made roller with front locking swivel wheels, and it’s just about perfect for me to load wood into the planer without having to stoop over and wreck my back. Pic of the stand, the cabinet is UGLYYYY, was made entirely of scraps. Make sure to get the in/out feed tables for the planer. A Byrd head makes these things incredible little machines, kinda loud with the blades in it. Save the money for the stand and make something, Something you can use for storage, never enough storage in a shop. I have the 735 with the in/out feed tables, the DeWalt cart and a DRO. I did not and I do not recommend buying this machine used unless you can try it out and make sure it’s okay. They are tough, make no mistake…it’s really a good planer. They did have an issue with blade bolts coming loose and sometimes the bolt gets into the exhaust fan and chews up the impeller. It’s a cheap enough fix, but for no more than what they cost new it seems like you would want to go that route. The DeWalt made cart that is purpose designed for the 735 is definitely worth every penny. So is the in/out feed tables. The Shelix doubles the cost of the machine and while it’s nice the blades are cheap and easy to change, so it’s a toss up to me. They also make carbide straight blades for a little over $100.00 if I remember right. I have a Shelix on my jointer and I have heard all the things it’s supposed to do for you…mine is not any quieter, it still has tear out and it doesn’t leave the surface any smoother than straight blades. It is way easier to change the cutters on and it lasts a very long time. However, those are big enough bonuses to me to go that route because the jointer blades were a royal pain to change out and set up perfectly. I have my 735 mounted on a wagon. roll it outside plane, roll it back in and done. only problem in northern wisconsin it;s hard to get through the snow drifts in the winter.lol. just bought a used delta 1.5 hp vac system last month from an estate sale. local retired shop teacher passed away . and his kids sold everything. Don’t try hooking up a shop vac to the 735. Counter-intuitively, you get a lot of blow back. There’s some kind of pressure imbalance between the chip ejector on the planer and the suction of the vac and you end up getting chips on the planing bed. I tried to make something that collected into a 5 gallon bucket (http://lumberjocks.com/projects/242570) but that didn’t work. I ended up running a flexible venting duct into an actual dust collection bag. Now I get no chips. Who needs to buy stands? 2×4s are cheap! Casters too. I like the DW cart. It is one of the better-built bases for the money. I did reverse the foot lever to aim inside so it does not stick out. Not so easy to push down, but you won’t kick it walking by the machine. -- A severed foot is the ultimate stocking stuffer. My DW735 is mounted on a cabinet with locking wheels. It gives me lots of storage and solid base. My cart was a lot less than $129 and a good chance to practice making a cabinet or cart. Just pulled the trigger on a new one. 479$ on amazon with tax brought it to 515$ for the 735x (which has the extra blades and tables). 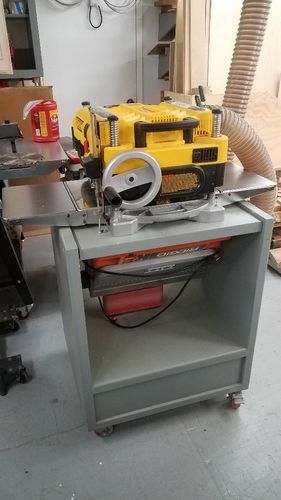 I got sick of seeing the used ones posted on CL in my area for 450$ (with no in/out feed tables) for a 8-10 year old planer. Then I call theses people and they all say they are firm on their price and they paid 600$ (which they probably did) new so Im getting a deal! Im not knocking them for what they paid (maybe there were no deals when they bought it) but sometimes you have to look at the current market when you buy/sell things. Haven’t decided what I’m doing for the base yet (make my own or buy dewalt). But I figured I can set it on my rolling tool box for now and at least get to using it. Thanks again everyone for your responses earlier.